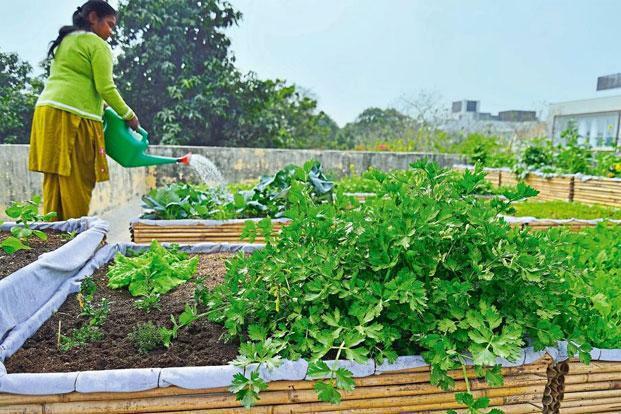 Increasing urbanization is leading to an increase in the demand for kitchen and terrace gardening. The idea is to grow more veggies instead of ornamental plants. Urban farming changes the entire temperature of the city. It combats the bad effects created by the environment. The green cover will help negate the adverse effects of so many concrete structures in Bangalore. Kitchen garden is a device to grow vegetables on a small plot of land. It is delightful hobby and can be pursued at homes or in school. A kitchen garden ensures an inexpensive, regular and handy supply of fresh vegetables which are basic to nutrition. Kitchen garden also helps us to solve our food problem. Apart from green and leafy vegetables, we can also grow several roots and tubers which are similar to cereals and provide us heat and energy. From a simple herb garden or a few fruit trees, to a full-blown feed-your-family vegetable patch – kitchen gardens are popping up everywhere. A kitchen garden doesn’t have to be complicated or labour intensive. Nor does it require a lot of space. Growing your own food has many clear advantages, but it also has some unexpected benefits. For a start, kitchen gardening is a great way for people to connect to nature. There are the benefits of having your own kitchen and terrace garden and growing fruits and vegetables. Having your own little garden saves a lot of time as you don’t have to visit the market as well. Grow and Glow Gardens helps you to setup Kitchen and Terrace Garden as per your requirement. Grow and Glow Garden is located in Bangalore. We have experienced Gardeners and Consultants who accommodate right from the scratch to make the most of the available space exclusively for Terrace Gardening, Landscape and Vertical Gardening. or Call us : 9008254541.